I am still really enjoying the process of creating this December Daily. I have continued to keep it simple and I think that has made all the difference. For Day 18, I had fun using some stickers that were gifted to me from crafty friends, Jenn (YT: ScrapbenaCreations) and Jill (YT: luvmy2pugs1). It amazed me that everything seemed to coordinate together even though I had prepped this page weeks ago. For Day 19, I included a colored print out of the free digi I made that day, “Gift From Down Under“ and some pics I snapped of Biscuit and Bandito after the hair cuts I gave them that day. They weren’t thrilled with me that day, but I loved how sweet they looked. 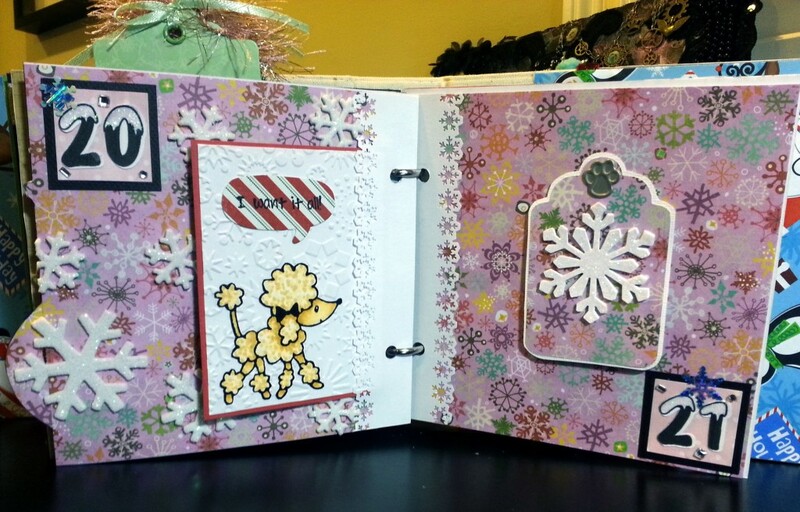 Day 20 was made just using some foam glitter snowflake stickers from the Dollar Tree for the page base and some paper from the Crate Paper “Snowy Day” collection. I made a little journaling card using a scrap piece of white card stock that I put through a Cuttlebug snowflake embossing folder and a poodle stamp from the Penny Black Penny Black “Mimi in Paris” stamp set, my current absolute favorite stamps! I colored it up to look like my Biscuit with the following Copic markers, using a dotting coloring technique to give the impression of curly fur: E50, 51, and 53. Day 21 was super simple, which was a great way to reflect a quiet Sunday (plus, as my December Daily is getting pretty fat, it was helpful to create a flatter page-LOL). 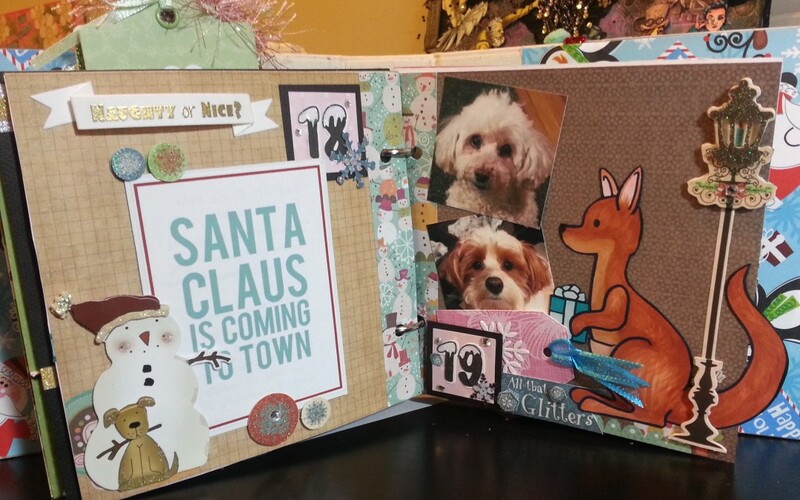 I just used a tag from the Diemond Dies Nesting Tag die set and a little silver paw shaped brad to create a swivel topper that hides that day’s journaling. 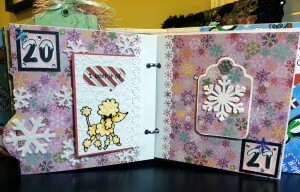 The tag is decorated using 5 stacked punch outs from a Martha Stewart Crafts Himalayan Snowflake Large Punch . I glued them together to create a more substantial looking embellishment and then coated the top one with some glitter glue. I love how this simple tag came out and plan to make more for gift tags. Diemond Dies is having a sale through December 31, 2014, so go check them out if you have a little extra shopping money left over or if you have someone just “dying” to get you something for the holidays. 🙂 Don’t forget to use the coupon code: thankskristina for an EXTRA 10% off your purchase, and if your order is $35 or more, you also get free worldwide shipping! Oh what fun these pages are! They will be so much fun to look back on! Thanks for playing along with us at the Simon Says Stamp Wednesday challenge! These pages are so wonderful! Love that page with the kangaroo and your sweet pooches! Your dog are the cutest! All your pages look great! So many pretty things to look at! 🙂 Thank you also for sharing your awesome kangaroo image; adore it!!! Hope you had a wonderful and fun Christmas!